Linksys Achieves New Industry Milestone. 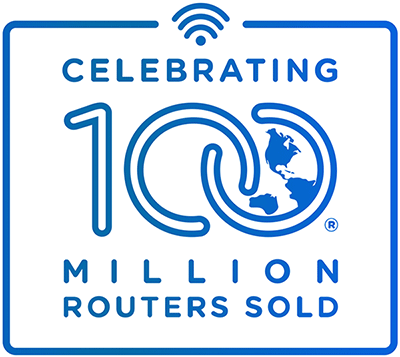 The First to Sell More Than 100 Million Routers. Irvine, Calif., – April 21, 2015 – Linksys®, a leader in networking solutions for the home and small and medium business, today announced it has sold more than 100 Million wired and wireless routers globally. Linksys pioneered the home router back in December 1999 when it shipped the first consumer grade router, the EtherFast Broadband Cable/DSL Router with 4-Port Switch – BEFSR41. This router revolutionized how consumers would share an internet connection in their home. Today, 16 years later and with more than 60 different routers connecting hundreds of millions of people and devices to the internet; Linksys has hit the milestone few technology products have achieved. According to forecasts by Industry Research firm IDC, by 2017, consumers worldwide will be using 9.8 billion devices capable of connecting to a home network router. The router has evolved over the past 16 years from wired routers to the different wireless standards – Wireless-B, wireless-G, Wireless-N, and Wireless-AC with the latest technology enhancements with Triband and MU-MIMO technology, which Linksys plans to ship first in a few weeks. Throughout the history of network connections in the home, Linksys has been a part of all if it. In keeping with its industry-leading approach, Linksys will be rolling out a global promotion called “Link Your World” that will help educate people about the value and importance that a router and wireless access plays in our daily life at home, on the go or at work. Linksys plans to roll out interactive programs and contests on Linksys.com and across its social media sites, as well as with retailers and value added resellers. Additionally, Linksys is in discussions with the U.S. State Department and other officials to obtain guidance that would permit distribution of wireless routers in Cuba, all in an effort to help with the financial and technological obstacles that currently block expanding Web access throughout the country. The company plans to be on the forefront of connecting Cuba, taking the “Link Your World” campaign globally. “It's hard to believe, but back in 1999 many people scoffed at home networking, saying it was too complicated. That's because it was, at least until a small company ran by Victor and Janie Tsao called Linksys introduced a new device that simplified the entire process of connecting multiple devices in the home. A hundred million routers later, the home router stands tall in the annals of consumer technology as an important invention that helped usher in the arrival of the broadband economy around the world. Linksys continues to be at the leading edge of advancing the router and its capabilities and will continue to push the envelope to bring faster, more seamless and ubiquitous Wi-Fi in homes and offices around the world. Check out the timeline infographic of all the routers we’ve developed and launched over the years that got Linksys to the 100 Million milestone today.